Our society is wired up for stress and anxiety. In fact, 18% of American adults, 40 million people, suffer with anxiety on a regular basis (1). Women are twice as likely to struggle with this than men. Recent evidence has shown that taking good care of your body and brain will reduce anxiety and support feelings of well-being. At the bottom of this article, you will discover 14 proven strategies to apply today to reduce anxiety naturally. 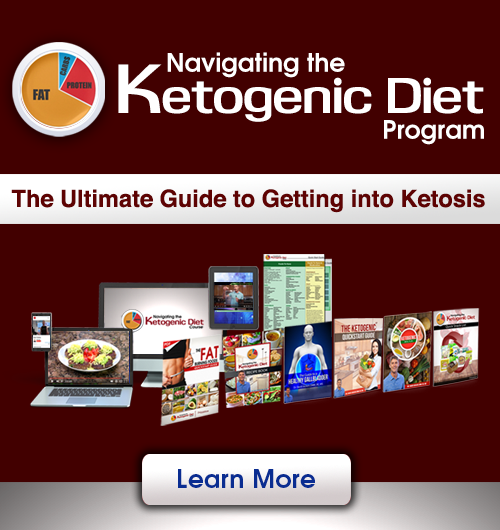 We have 2 dominant pathways that govern the processes within our body. One is called the sympathetic nervous system that drives a “fight or flight” response that helps us survive and perform. The parasympathetic wing of our nervous system is the antagonist to the sympathetic in that it helps our body to relax, digest food and heal. Individuals with anxiety are in a state of sympathetic dominance where they are in a near constant state of fight or flight. The brain is the most complex and incredible organ on earth. The brain contains 100 billion nerve cells and each of these are interconnected with other nerve cells through hundreds and thousands of other synapses (or little gaps between neurons). There are believed to be more connections within the brain than there are stars in the sky. Brain cells are constantly fluxed with both excitatory and inhibitory signaling molecules. Individuals with anxiety have a poorly controlled balance that favors over excitation in certain regions of their brain. 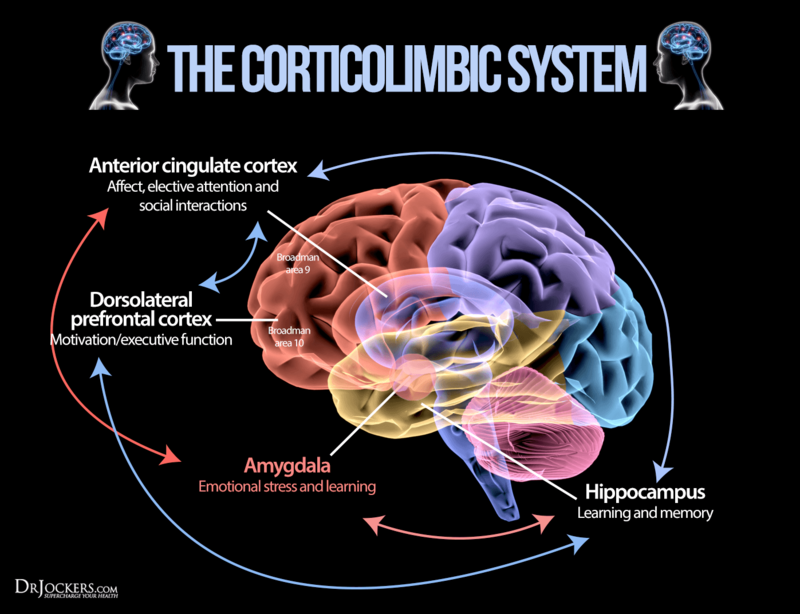 Here are the key brain regions and mechanisms that may favor the development of anxiety. This is the stress response system of the body. 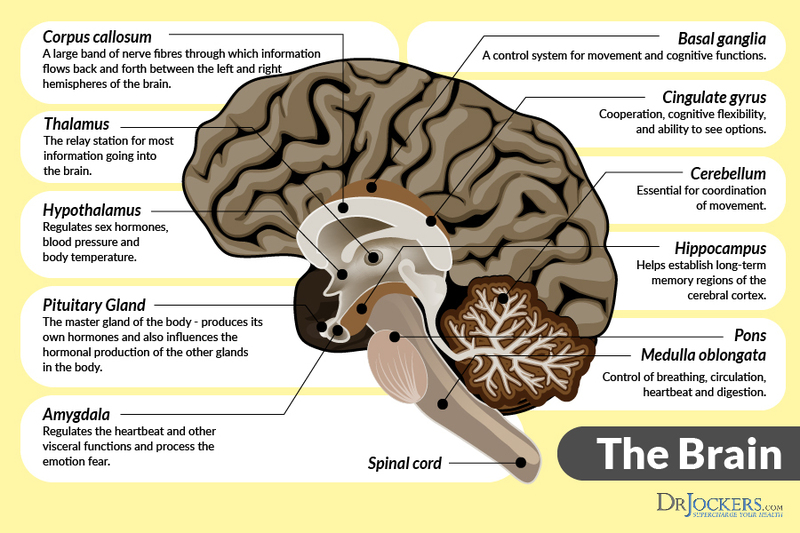 The hypothalamus (located under the thalmus near the lower center part of the brain. This is part of the limbic system, which is explained below. The hypothalamus is a sensor that is constantly monitoring the blood stream for any signs of potential danger. When the hypothalamus senses danger, it sends a rush of a neurohormone called corticotropin releasing hormone (CRH) to a small, but powerful gland called the pituitary gland. The pituitary sits in a boney projection that looks like a horse’s saddle (and is called the sella turcica, which means horses saddle) in the very center of the brain. The pituitary then sends a signal to the adrenals through a neurohormone called adrenal corticotropin hormone (ACTH). This tells the adrenals to pump up the production and release of stress hormones like cortisol, epinephrine (adrenaline) and norepinephrine. This region is located near the center of the brain and it helps to integrate feelings, thoughts and movement together. This is the part of the brain that has us shake when we are nervous, jump when we are excited and scream when we are scared. The role of the basal ganglia is to give us the correct movement patterns to go with our emotional feelings and perception of our environment. When we have elevated stress hormones or inflammation in this region, the basal ganglia gets wound up and causes chronic anxiety. This includes the amygdala, hypothalmus and the hippocampus. It is the emotional brain, as it stores our emotional responses to the environment we perceive. It helps to store highly charged emotional responses to the events of our past along with the Temporal lobe. When this part of the brain is tempered or cool we typically flow with positivity. When this area is out of balance due to high or low stress hormone production, it can get hot and create a depressive spiral of thinking and behavior. Proper movement is key to keeping the limbic system balanced and under control. This region of the brain runs lengthwise through the deep aspects of the frontal lobes. This region of the brain allows for cognitive flexibility. This region depends upon the neurotransmitter serotonin. When the body has chronic stress it can lead to a hot anterior cingulate gyrus and resulting worrying and obsessive compulsive behavior. 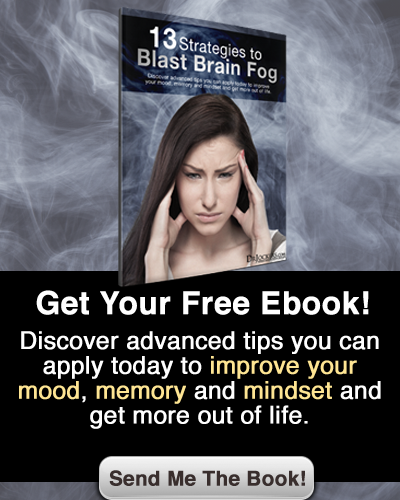 The strategies in this book allow for normalized serotonin levels and a cooling effect of the anterior cingulate. One of the most common findings with individuals suffering from anxiety is poor blood sugar balance (2). When we eat a diet higher in carbohydrates, our blood sugar naturally rises, which then causes the release of the hormone insulin. Insulin helps to take sugar out of the bloodstream and put it into the cell. Individuals with anxiety tend to over-secrete insulin, causing a reactive hypoglycemia. Low blood sugar, or hypoglycemia puts a lot of stress on the adrenal glands, which produce the stress hormone cortisol to keep blood sugar stable (3). When we have low blood sugar, the brain begins to starve, which raises its resting threshold and makes it hyper-exciteable, setting the pace for anxiety. In particular, the regions associated with survival, the basal ganglia, limbic system and anterior cingulate gyrus begin to overfire. In this position, the brain is in survival mode, so it reacts to seemingly small stimulus…much like someone who has anxiety may feel overwhelmed by what others would deem to be smaller life stressors. Overtime, if the individual continues to consume a higher carbohydrate diet and being exposed to other stressors, they can fatigue the adrenals and not be able to produce enough cortisol to maintain blood sugar levels. The body will then begin to use higher amounts of adrenaline (epinephrine and norepinephrine) to maintain blood sugar. These stress hormones are much more potent and can cause a rapid increase in heart rate and breathing rhythms that lead to panic attacks. Additionally, an out of whack stress response depletes vital nutrients such as magnesium, potassium, B vitamins and zinc. This only further malcoordinates the stress response creating a vicious cycle that can be devastating to one’s health and quality of life. Balancing blood sugar and providing adrenal support should be the FIRST step in any sort of lifestyle plan for an individual with anxiety and panic attacks. Here are the best action steps to get started with on your journey to overcome anxiety. You should always consult with your physician before stopping or changing medications or taking on new health strategies. Additionally, you should be working with a functional health practitioner to help guide you through these strategies. This is not an exhaustive list and there are other natural therapeutic strategies that I and functional health practitioners will utilize to help individuals with anxiety. Water is very important for balancing stress hormones and reduce inflammation in the brain. When we become dehydrated, we release more stress hormone and ramp up our basal ganglia, limbic system and anterior cingulate gyrus. This creates the feeling as though we are “on edge. Drinking 8-16 oz of clean water or water with lemon or essential oils added can be one of the best ways to tone down the brain and to put us back at ease. I recommend beginning your day with 16-32oz of water first thing in the morning and drinking 4-8oz every 2 hours throughout the day. Your goal should be a minimum of half your body weight in ounces of water each day. We know that blood sugar balance is a critical factor, so building the diet around good fats such as coconut products, avocados, grass-fed butter or ghee, olives and olive oil is extremely key. Additionally, you want a clean protein source at each meal. This can come from grass-fed animal products, wild-caught fish which are all good sources of protein, essential fats and zinc. Consuming a lot of vegetables is extremely important in order to replace B vitamins, potassium and magnesium. Making green juices or using a greens powder can be helpful. Doing lemon or lime in water can help to replace lost potassium. Fermented foods such as kimchi, sauerkraut and coconut water kefir provide a lot of helpful B vitamins and potassium to help with the stress response. Be sure to only use natural sweeteners such as stevia, xylitol, monk fruit or raw honey in small moderation and use advanced strategies to help balance blood sugar levels. Neurobics are a group of exercises that involve both unique and non-routine ways of moving and thinking. The new patterns challenge the brain to adapt and grow in order to fulfill the task. 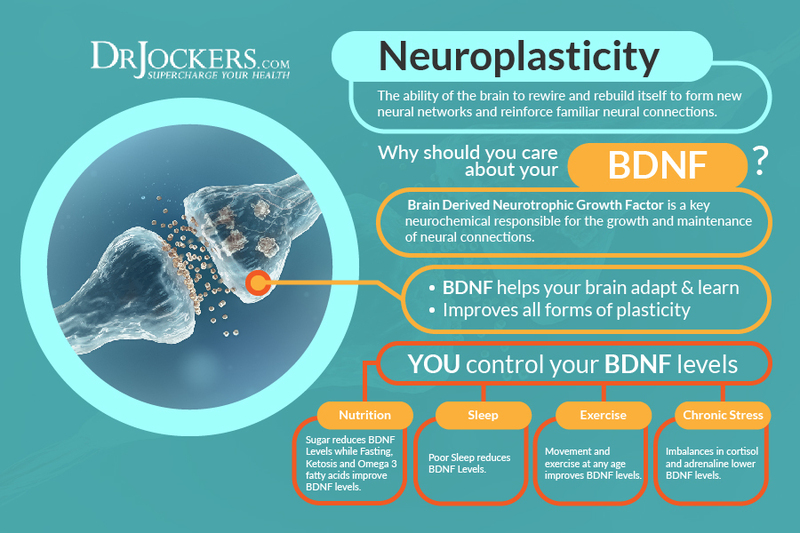 These are simple exercises that have a powerful effect at improving neurogenesis or the formation of new neuronal cells and brain connections. This helps to improve learning, stress adaptation and calmness in the brain. Visualization is a profound exercise that is known to improve the formation of new neuronal cells, reduce the stress response in the brain and help us to overcome life challenges. Simply take time to see the best possible outcome for your present concern. However, don’t only visualize the best possible outcome of whatever you are worried about, but also take time to visualize yourself confident and relaxed in whatever challenging future circumstance may come about. Practice deep breathing while you are visualizing for the best possible outcomes. This is a practice that has freed many people from test anxiety, performance or speaking anxiety, sleeplessness and various phobias. Use it to help you overcome your struggle with anxiety. One of the best practices for reducing stress, worry and fear is taking time to take long, deep breaths. This practice takes you out of the sympathetic fight or flight mode and puts us into a parasympthatic mode that dampens the hot areas of the brain and allows us to rest and heal. Practice for 5-10+ minutes while applying positive visualization to help calm and relax your body and mind. Sugar and caffeine will ramp up activity in the brain and may make you feel better in the short-term but they both things will increase inflammation and stress hormone production in the brain and wire the key regions of the brain involved in anxiety. While drinking coffee may have many health benefits, individuals who struggle with anxiety should minimize their consumption in order to cool down the brain. Blood sugar was discussed in detail in this article so it goes without saying why we need to avoid sugar and high carbohydrate foods. In our society we are surrounded by toxic electromagnetic frequency’s (EMF’s). These EMF’s increase stress within our body and alter neurotransmitter function. There is a key connection between the brain and the gut that I explain in great detail in this article. The brain plays an important role in modulating the motility of the gut through the vagus nerve. The gut houses trillions of bacteria that metabolize nutrients and help to form neurotransmitters. In particular, Bifidobacterium which populates the large intestine helps to metabolize the excitatory neurotransmitter glutamate and form the inhibitory neurotransmitter GABA. High levels of glutamate to GABA will increase activity in the brain and promote anxiety, irritability and emotional imbalance. Follow a specific program to heal your gut while supporting your adrenals and you will see much faster results. Food sensitivities are foods that your body doesn’t tolerate well and has an immune reactivity too. In these cases, the body creates an inflammatory storm when you consume the food particle. This will damage the gut lining and inflame the brain. You can identify major food sensitivities through a lab test her or a biofeedback test here. The most common food sensitivities for individuals with anxiety are gluten, corn, dairy, soy and peanuts. But there could be other, seemingly healthy foods that your body is sensitive too as well. I always recommend a 4-6 week elimination diet before trying any of the susceptible foods back in order to allow the body to heal. Overtime, the body will become less sensitive to many foods in the future. They say that “laughter is our best medicine,” and this is true when it comes to the feelings of anxiety and worry. Laughing helps to stimulate endorphins and other feel good neuropeptides that reduce the stress response and boost up confidence and feelings of peace. The best type of laughing for someone with anxiety would be general chuckles and light joking. This can be extremely restorative. Avoid massive laughter episodes which can trigger the release of more stress hormones. We often spend so much time focused on what is wrong and what we are frustrated by. Taking time each day to journal about what you are most grateful for can be one of the most powerful daily activities. You can also incorporate this into your breathing, meditation and prayer practices where you remind yourself of what you are most grateful for. This will relax your mind, increase endorphins, reduce stress hormone production and stimulate parasympathetic tone in the body. Healthy sun exposure provides healthy UV rays that stimulate vitamin D production and reduce the stress response. This will help to cool down the anxiety loop and increase feelings of peace and relaxation. Vitamin D is also key for improving neurogenesis or the development of new neurons which helps us overcome anxiety and depression. Several studies have shown that individuals with anxiety tend to have lower vitamin D levels (4, 5). Try to get high quality sun exposure everyday if possible on as much of your body as possible. Avoid sun burning, but aim to get a mild tan. Magnesium helps to improve the brain’s stress response by protecting the neurons from over excitation. It also maintains the integrity of the blood brain barrier and reduces the amount of stress hormones that are able to get into the brain. Additionally, it helps to balance and stabilize blood sugar levels. The best forms of magnesium are those that cross the blood brain barrier where they can help to modulate the HPA Axis and the bodies stress response system. These include magnesium malate, magnesium threonate and/or magnesium glycinate. I have ALL of my clients with anxiety use Brain Calm Magnesium, which has a patented and researched form of all 3 of these forms of magnesium. Standard dosing is 1 scoop in water 2 times daily. However, individuals with anxiety usually need more, at least at first. I will typically have them put 2 scoops in an 8-16oz water bottle and drink 3-4 of those throughout the day. This makes a HUGE difference! God wants us to give Him our worries, doubts, fears, stressors and setbacks. He is our father and He looks down upon us with a loving concern for our well-being. In fact, He loves us more than we could ever love ourselves. Spend time speaking these verses over your life. 2. Davidson MB. Equating Anxiety and Low Blood Sugar. Western Journal of Medicine. 1976;125(6):433. 5. Huang JY, Arnold D, Qiu C, Miller RS, Williams MA, Enquobahrie DA. Association of Serum Vitamin D with Symptoms of Depression and Anxiety in Early Pregnancy. Journal of Women’s Health. 2014;23(7):588-595. I would love to share this great list with many people but for the Christian part at the end which would be offensive to some. That would be a shame for anyone to be offended by inspiring biblical truths. I would share it with them anyways! Be Blessed! I live in the Pacific Northwest where sun seldom shines this time of the year. My last Vitamin D test was just last week and it is at 25. How can I help myself? Replying to Carol, regarding dark chocolate, I love chocolate and found an alternative that is sweetened with stevia and xylitol called Lily’s dark chocolate, also sells chocolate chips. This does not affect my blood sugar or activate yeast and tasts great! I love the biblical references, Dr. Jockers keep them coming- if anyone is offended, that is their problem. Dr. Jockers–any thoughts/comments regarding nighttime anxiety that interferes with sleep? I follow an antiinflammatory diet, take GABA, rhodiola, ashwaganda, Vit D 5K units, fish oil, B vitamins, deep breathe, etc. Sometimes these symptoms last 1-2 days and I finally get rest with 1/2 tablet of Alprazolam, which I resist at all costs. Hey Julie, I would look into issues with parasites and/or issues with EMF’s which can often cause restlessness.